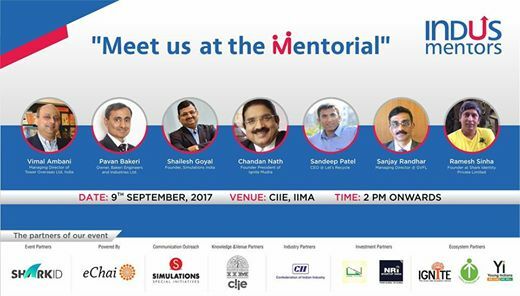 Indus Mentors in association with eChai, will be organizing – Mentorial 2017, one of its kind event which will bring together eminent mentors, deserving startups and prospective investors on a common platform at CIIE, IIM Ahmedabad on 9th September, Saturday. The Mentorial 2017 is greatly supported by CIIE as Knowledge Partner, CII as Industry Partner, Sharkid as Event Partner, Ignite, Young Indians (Yi) & EDI are the Ecosystem Partners, Simulations Special Initiatives as Communication Outreach Partner and NRI Startup India & Lothal Ventures are the Investment Partners. – Indus Mentors is a dedicated platform which connects deserving startups with the right mentors. – It enlists panel of eminent mentors from different walks of business life who are committed to handhold startups on a continuous basis and help them grow in their entrepreneurial journey. – A startup can apply on this platform to get connected with the mentor of his choice and once on board, a mentor is liable to negotiate a sweat equity between 0-5% with the startup. – Against this sweat equity, a mentor will have to devote 1/hr per week to mentor the startup. 10% of the equity of mentor is the fee a startup will have to pay additionally to the Indus Mentors. – Get a chance to showcase your venture in front of the leading mentors. – Potential opportunity to get investment for your venture. Apply at http://Bit.ly/PitchYourStartup Indus Mentors Team will get back to you after you submit your application. – 9th September – Mentorial 2017. Selected startups will get the opportunity to present their ventures in front of the Jury of Mentorial 2017. – 2.10 pm – 3.10 pm – Panel discussion about the Importance of Mentorship with Jury Members. Moderated by Jatin Chaudhary. – Vimal Ambani, MD, Tower Overseas Ltd.
– Pavan Bakeri, Bakeri Engineers & Industries Ltd.